We’d love your help. Let us know what’s wrong with this preview of At Your Service by Jen Malone. When the spoiled brat child of an important guest is only placated by some quic Thirteen-year-old Chloe Turner wants nothing more than to follow in Dad’s footsteps as a respected concierge in a posh NYC hotel. After all, living at a hotel is heaven, and perks like free concert tickets and all-access passes to boutiques, restaurants, and attractions aren’t too shabby either. To ask other readers questions about At Your Service, please sign up. What are the ages for this book? My 13-year-old daughter and I read an ARC of AT YOUR SERVICE for an upcoming Kidliterati.com post. Chloe Turner aspires to be just like her father, an outstanding concierge at a 5-star NYC hotel. Through hard work and some clever planning, she earns the title of Junior Concierge. But her next job won't be so easy. While giving a tour to the children of visiting royalty, the youngest princess slips off on her own into the busy streets of NYC. Chloe and the others must race to find the little princ My 13-year-old daughter and I read an ARC of AT YOUR SERVICE for an upcoming Kidliterati.com post. Chloe Turner aspires to be just like her father, an outstanding concierge at a 5-star NYC hotel. Through hard work and some clever planning, she earns the title of Junior Concierge. But her next job won't be so easy. While giving a tour to the children of visiting royalty, the youngest princess slips off on her own into the busy streets of NYC. Chloe and the others must race to find the little princess before the end of the day. Jen Malone's debut AT YOUR SERVICE is everything that I love about middle grade -- a pitch-perfect voice, a fresh concept, and a rollicking adventure. And sure, the cute but oh-so-full-of-himself prince doesn't hurt either. A) Enjoy a NYC adventure from your very own home. B) Jen Malone is a new MG author to watch. I first read Jen Malone's wonderful debut three years ago, and let me tell you: it holds up. As an author of tear-jerker stories, I can tell you it's sometimes hard to find middle grade novels with heart and a sense of lightness. Jen nails the balance--not just in Chloe's story, but in her other books as well. We join Chloe in NYC, where she's thrilled to work as a junior concierge at the fancy hotel where her father works. Unfortunately, her fun and fast-paced job of helping junior guests have f I first read Jen Malone's wonderful debut three years ago, and let me tell you: it holds up. As an author of tear-jerker stories, I can tell you it's sometimes hard to find middle grade novels with heart and a sense of lightness. Jen nails the balance--not just in Chloe's story, but in her other books as well. We join Chloe in NYC, where she's thrilled to work as a junior concierge at the fancy hotel where her father works. Unfortunately, her fun and fast-paced job of helping junior guests have fun in the city takes a turn for the worse when three royal kids arrive. They're sort of snobby, they've seen all the usual sights, and the youngest even goes missing. Tweens are going to flip for this book--for the subject matter, for the main character, and for the writing style, which is spot-on, 12-to 13-year-old girl. I thoroughly enjoyed reading it myself and can't wait for my daughter, who is a reluctant reader, to dig into it. While the book is based in an atmosphere of the rich and famous, the characters are down to earth and relatable. I can absolutely see this book being made into a TV movie or series on the Disney channel. Jen Malone wove a great plot with fantastic voice. I was impressed by her use of many similies tied into the setting of the book, New York City. (ex: "..she's all lit up like the crystal ball that drops in Times Square on New Year's Eve.") The book is tightly written and a fun read. Kids will love it! Chloe loves living in the St. Michele hotel in New York City, where her father is the concierge. She also likes helping out, and is made a junior concierge by the owner, Mr. Buttercup, so that she can help with the younger guests. She manages to make even the brattiest children happy by scheduling things like practice sessions with the Rockettes for them. When King Robert of Somerstein and his three children stay at the hotel, Chloe is put in charge of their itinery, and accompanied by bodyguard Chloe loves living in the St. Michele hotel in New York City, where her father is the concierge. She also likes helping out, and is made a junior concierge by the owner, Mr. Buttercup, so that she can help with the younger guests. She manages to make even the brattiest children happy by scheduling things like practice sessions with the Rockettes for them. When King Robert of Somerstein and his three children stay at the hotel, Chloe is put in charge of their itinery, and accompanied by bodyguards, the royals (along with Chloe's friend Paisley) set off to see the sights. Prince Alex turns out not only to be cute, but also very nice; Princess Sophie seems stuck up at first, but warms to the adventure; but Princess Ingrid, the youngest, decides to run off from the group to investigate all of the penny smashing machines in the city. Chloe doesn't want to tell her father, thinking she will get in trouble, so the children band together to find Ingrid but not alarm anyone back at the hotel. Adventures ensue, there are some nice romantic moments, and everyone is okay in the end. Strengths: This is a fantastic middle grade adventure. I love that Chloe is empowered to deal with other concierges and businesses in the city, and given opportunities to see New York, but always under some kind of supervision. I think this is probably the sort of book that my readers enjoy the most-- ordinary children who DO something. To quote Chloe Turner: "HOLY WOW"
This is a fast-paced, riotously funny middle grade book about Chloe Turner, a "junior concierge" at the super-fancy Hotel St. Michéle in New York City, and her adventures with a family of royals. The adorable factor on this book is off the charts. First there's Chloe, whose matching pens and shirts will give you an idea of her personality. Then there's her best friend, Paisley, down-to-earth and super loyal. We've got the three royal kids, Alex (the surfer-lookin To quote Chloe Turner: "HOLY WOW"
This is a fast-paced, riotously funny middle grade book about Chloe Turner, a "junior concierge" at the super-fancy Hotel St. Michéle in New York City, and her adventures with a family of royals. The adorable factor on this book is off the charts. First there's Chloe, whose matching pens and shirts will give you an idea of her personality. Then there's her best friend, Paisley, down-to-earth and super loyal. We've got the three royal kids, Alex (the surfer-looking cute prince), Sophie (regal, poised), and Ingrid (curious, wild). Along with the staff of the St. Michéle, who are all (with the exception of Mr. Whilpers, the sourpuss) quite fun. I love me a funny book, mostly because writing funny is so hard...and so wonderful to read. I loved AT YOUR SERVICE even more. Chloe is a junior concierge, working at the hotel where she lives. She's charged with a royal trio of siblings... and then one gets away. This book. OH I loved this book. From the opening lines, Chloe's voice is crisp, funny, and whip-smart. Jen Malone (and Chloe) takes us on a whirlwind tour of Manhattan, dropping fun trivia and interesting descriptions without ever feeli I love me a funny book, mostly because writing funny is so hard...and so wonderful to read. This book is such a fun, sweet love letter to New York City. I think that kids who live there, kids who have just visited, and kids who dream about going someday will adore it equally. Speaking of dreaming, Chloe Turner pretty much has a dream job for a 13-year old as junior concierge, escorting young guests at a 5-star hotel on adventures around town. I'm certainly partial to stories of tweens trying their hands at grown-up professions, and Chloe's story includes all of the excitement, risk, and This book is such a fun, sweet love letter to New York City. I think that kids who live there, kids who have just visited, and kids who dream about going someday will adore it equally. A fun romp through NYC with a cast of great kids! I think 5th, 6th and 7th grade girls will love this story which has equal parts humor, friendship and adventure (and toss in a dash of an innocent first crush to round it off)! My 11-year-old daughter finished in two sittings and loved this adorable middle grade by Jen Malone. She particularly loves the race across NYC and Chloe's collection of pressed pennies! This is a perfect book for kids 8+. I really liked it. i absolutely loved the romance/anoyance combonation!Alex and Chloe were my favorie charicters.My favorite part in the entire book, was when Alex kissses Chloe in the wax museum.It was an awesome book and i would love to read it again. I was lucky enough to read an early version of this book, and it's one you don't want to miss! How can you possibly go wrong with a 13 year old concierge? Funny, exciting, and just a lot of fun. Chloe knows exactly what she wants to be when she grows up, a five star hotel concierge just like her Dad. And since she lives in a hotel and helps her dad out all the time, why not get any early start on that career as a junior concierge? The hotel is a little wary at first, but after the comes away with a glowing review from the absolute toughest customer the hotel has, the owner is ready to back her up. But Chloe's real test comes in the form of three actual royal children who are visiting Ne Chloe knows exactly what she wants to be when she grows up, a five star hotel concierge just like her Dad. And since she lives in a hotel and helps her dad out all the time, why not get any early start on that career as a junior concierge? The hotel is a little wary at first, but after the comes away with a glowing review from the absolute toughest customer the hotel has, the owner is ready to back her up. But Chloe's real test comes in the form of three actual royal children who are visiting New York and it's up to her to remember all the rules about talking to them and show these stiff upper crusts a good time. But Chloe is good at her job, so this shouldn't be a problem, right? Well, think again. When you regularly take tours of the Sahara on camels and have tea with the Queen of England, it turns out you can be pretty hard to impress. Princess Sophie makes no qualms about letting Chloe know that New York is dirty and boring. Prince Alex seems stuck up with himself and more interested in the latest Apple gadget than New York tourism. Thank goodness little Princess Ingrid is easier to please. She gets very excited about the penny pressing machine at FAO Schwartz, but then throws a fit when Chloe tells her they don't have time to visit every penny press in the city. It turns out Princess Ingrid is not put off by a foreign city or junior concierges because the next time Chloe turns around, 9-year-old Ingrid has vanished. Prince Alex is determined to find her on their own, as he is afraid military school is in his future unless he shows some leadership skills, and what kind of leader lets a little girl escape from under his nose. Chloe also wants to prove herself to her father, so the kids agree to give the royalty's security detail the slip and set out to find Ingrid on their own. Along the way, they will all learn more about each other and themselves. I have a group of students who regularly visit the Media Center and beg me for new realistic middle school girl fiction. They currently subsist on a steady diet of How I Survived Middle School, Allie Finkle, and the Baby-Sitters Club graphic novels. I heard about this book on a list of good middle grade books that came out in 2014, but this M!x series could be just my ticket to providing enough books to satisfy even those ravenous middle school girls. I'm super happy to have found out about this line of books. I know the girls will be all over this book and eat it up. (I should probably go ahead and get another copy or two.) And let's face it, my middle school self would totally agree. Chloe is a driven young lady who is working hard and reaching her goals, something very admirable. Her job and it's perks seems like something made up in a fantasy world. She gets to meet a real live prince, and there's even a hint of romance there. And the whole idea of royals wanting to be normal kids is probably very overdone in literature (though probably also true), but it still makes this a fun story. (Random side note: Jen Malone gets bonus points in my book for giving Princess Sophie the ability to mimic birds and cause Chloe to wonder if the whole Snow White ability to talk to birds runs in their blood. Made me laugh.) This book just gushes fun and cuteness. Of course, there's the very real problem of the runaway princess, and that stress does start to get to the kids which adds some depth to the story. The grown-up part of me was satisfied with the ending and the parents' responses to this crazy plot, and glad that the kids all seemed to learn good lessons. Oh yeah, those middle school girls better watch out or they might accidentally learn some important life lessons about teamwork and trusting adults. A free copy was received from the publisher via Edelweiss in exchange for an honest review. At Your Service was not my favorite M!X Book. I liked it, but there were things that I didn't enjoy about it as well. It was still a super cute book I would recommend to a middle school girl in a heartbeat, though! Chloe, the main character of At Your Service, had a well thought out personality. She was basically your average thirteen year old girl...except for the fact that she lives at an upscale New York hotel. Let's be honest, almost any kid who watched The Suite Life of Zach and Cody (which is, I guess, outdated now, but they still show reruns) has dreamed of living at a hotel. It's just cool. Plus, the girl had some really funny lists. This book also has a nice message, and I appreciate that it wasn't in your face like some books. (All the M!X Books I have read are pretty good about not making their books 'preachy.') This one was about not being scared to ask for help when you need it, and also, to an extent, about not judging a book by its cover. A.) The book has lots of little asterisks and then notes on the bottom, which started to annoy me after the bit. It ended up disrupting from the overall flow of the story. B.) The secondary characters ended up being a bit stereotypical. Chloe's best friend, Paisley, was the outgoing sidekick to the main character that everyone seems to love. Alex was the totally hot prince from a foreign country that can steal hearts with a single glance. Sophie was the preppy, somewhat prissy sister. Ingrid was the youngest sister who seems sweet but is a bit spoiled. C.) Like Chloe says, lists always seem more complete with a C option. Also like Chloe, I do not have anything to list for C.
Like her concierge father, Chloe Turner has a knack for helping people enjoy their vacations at the fancy New York City hotel where she lives. After she works extra hard to please a particularly bratty young guest, she is hired as the hotel's junior concierge, just in time for a visit from three young European royals. Chloe thinks she is prepared for the challenge of entertaining a prince and two princesses - until the youngest princess wanders off into the streets of New York on her own! Though Like her concierge father, Chloe Turner has a knack for helping people enjoy their vacations at the fancy New York City hotel where she lives. After she works extra hard to please a particularly bratty young guest, she is hired as the hotel's junior concierge, just in time for a visit from three young European royals. Chloe thinks she is prepared for the challenge of entertaining a prince and two princesses - until the youngest princess wanders off into the streets of New York on her own! Though the events of At Your Service are pretty unlikely, the story will appeal to tween readers for a number of reasons. First is the behind-the-scenes look at the hotel industry. 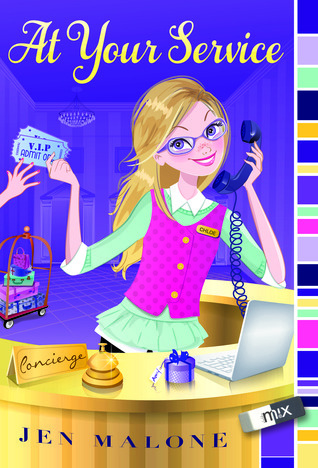 Kids tend to be fascinated by hotels, and this book introduces some of the lingo used by the employees as well as their day-to-day activities. Second is the mystery storyline. Though the story takes a while to get going, the main focus is figuring out where the missing princess has gone and where she will go next. This involves a lot of strategizing and quick thinking which really highlights Chloe's resourcefulness and independence and builds suspense. Finally, readers will like the subtle romance that develops between Chloe and Prince Alex. It's a very innocent relationship, with only a few instances of physical contact (holding hands, and a kiss), which will appeal to elementary and middle school readers. Though At Your Service is from the same imprint as 30 Days of No Gossip and Best Friends... Until Someone Better Comes Along, it has an entirely different focus and will probably appeal to a totally different readership. Whereas these previous books are about girls acting catty and hurting each other's feelings, At Your Service features a girl using her wits to solve a problem and doing her best despite her mistakes. Jen Malone has pleased me to the point of epic flailing with her YA contemporary novels (Wanderlost and Map to the Stars), so I decided the time had come to give her middle grade backlist a shot. So far so good because At Your Service is cute, funny, fluffy, and has a baby middle grade ship to boot. While the ides of Chloe being employed as a junior concierge at a majorly classy New York City hotel at the age of thirteen is laughable, I do really love that Chloe dreams of concierging. It’s always Jen Malone has pleased me to the point of epic flailing with her YA contemporary novels (Wanderlost and Map to the Stars), so I decided the time had come to give her middle grade backlist a shot. So far so good because At Your Service is cute, funny, fluffy, and has a baby middle grade ship to boot. While the ides of Chloe being employed as a junior concierge at a majorly classy New York City hotel at the age of thirteen is laughable, I do really love that Chloe dreams of concierging. It’s always nice to read about kids and teens who dream of careers outside of the ordinary. Pop culture tends to highlight a few main ones, and everyone can’t be an actor/singer/doctor/lawyer. Books like this open kids’ eyes to the fact that there are a whole bunch of cool things that a person can do. Chloe’s job is to help her dad, the actual concierge, out with the kids who stay at the hotel. Since she’s young, she has a better idea what her peers would enjoy out in the city. As such, Chloe gets to hang out with royalty when the royal family of a small (fictional) European nation comes to stay at the hotel. They bond, explore the city, and get up to hijinks. Also, Chloe gets to flirt with the fourteen-year-old prince! View Spoiler » The resolution is quite satisfying, and I’m impressed with the parental involvement (middle grade parents sometimes are the most neglectful unaware people ever). Originally reviewed on The Escapist. *This review is based on advance reading copy. There might be some changes in the finished copy. After the successful challenging task of making a particular guest..smile, Chloe became the Junior Concierge where she handles the younger guests on the hotel. When she thought this guest was challenging, say hello to the royal guests. What do royals need when they have everything? Chloe is a positive and fun girl to be with (in my case, read with). She's a nice a Originally reviewed on The Escapist. Chloe is a positive and fun girl to be with (in my case, read with). She's a nice and clever girl who everyone loved--including the guests--well, maybe except for Mr. Whilpers. I have also come to like this girl. Her personality matches the cute cover and good vibes of this book. I enjoyed At Your Service! It is fun and hilarious read. I like the adventures and the overall good story. This book is recommended to teens, tweens, and even younger audience. Prepare to be toured in NYC by Hotel St. Michele's very own Junior Concierge--it's like you are the guest! This book is super cute. Chloe lands a job as a junior concierge after proving her stellar abilities with a difficult hotel guest. But she really meets her match when she is given the responsibility of entertaining the children of a visiting royal family. They aren't what she expected and they pose a challenge that even Capable Chloe might not be able to fix. This is a lighthearted romp around New York City that will appeal to middle grade and tween girls. It's entertaining, fun, and clean. My fa This book is super cute. Chloe lands a job as a junior concierge after proving her stellar abilities with a difficult hotel guest. But she really meets her match when she is given the responsibility of entertaining the children of a visiting royal family. They aren't what she expected and they pose a challenge that even Capable Chloe might not be able to fix. This is a lighthearted romp around New York City that will appeal to middle grade and tween girls. It's entertaining, fun, and clean. My favorite parts are Chloe's footnotes that were inserted every so often. Recommended for girls ages 9 and up that like contemporary, humorous fun. Source: I received a digital galley of this book in exchange for an honest review. "Making people happy—even if it’s only for the length of their vacation—is like having a superpower." Chloe lives in NYC at the St. Michèle with her father, the concierge of the extremely ritzy hotel. Her life's dream is to follow in her father's footsteps, and one day, become a concierge herself. When the hotel is set to host the Royal Family of Somerstein, Chloe lands the coveted job of showing off her city to the family's three children: an arrogant prince, a spoiled princess, and a tiny prin "Making people happy—even if it’s only for the length of their vacation—is like having a superpower." Chloe lives in NYC at the St. Michèle with her father, the concierge of the extremely ritzy hotel. Her life's dream is to follow in her father's footsteps, and one day, become a concierge herself. When the hotel is set to host the Royal Family of Somerstein, Chloe lands the coveted job of showing off her city to the family's three children: an arrogant prince, a spoiled princess, and a tiny princess with a big love of coins. The St. Michèle's youngest-ever concierge is going to earn her "five-diamonds" on this one. Will Chloe succeed in making her three royal guests happy? I won't reveal more than this...she certainly fulfilled her duties for this reader. You cannot help but love this goal-oriented, organized, administrative, dot your "i"s and cross your "t"s little superhero! My 9 year old daughter read this book and loved it. Some nights we would only be able to read a chapter or 2 and she would beg me to keep going. (as would her younger sister) I would say she was a bit young to be reading it, She had trouble with some of the reading so it was a read aloud with Mom book for us. They laughed and giggled when Alex and Chloe shared a special moment. "At Your Service was a good book. I liked it when they went to FAO Schwartz and Dylan’s candy bar and My 9 year old daughter read this book and loved it. Some nights we would only be able to read a chapter or 2 and she would beg me to keep going. (as would her younger sister) I would say she was a bit young to be reading it, She had trouble with some of the reading so it was a read aloud with Mom book for us. They laughed and giggled when Alex and Chloe shared a special moment. I want Chloe Turner as my concierge! I ripped through this adorable book! I'll cut right to the chase: This book is Voice-y with a capital V! Chloe is so witty and clever; I was giggling and snickering on every page. Not only was Chloe's ambitious and sarcastic nature perfectly depicted, but New York City really came alive on the page. Author Malone really captured it well (still LOLing at the very accurate subway scene). This book made even my cynical heart ADORE the Big Apple. I was practically I want Chloe Turner as my concierge! I ripped through this adorable book! I'll cut right to the chase: This book is Voice-y with a capital V! Chloe is so witty and clever; I was giggling and snickering on every page. Not only was Chloe's ambitious and sarcastic nature perfectly depicted, but New York City really came alive on the page. Author Malone really captured it well (still LOLing at the very accurate subway scene). This book made even my cynical heart ADORE the Big Apple. I was practically whistling on the city streets on the days I was reading this charming book! There's also a wild cross-city chase and the sweetest first-crush mini-romance, for those looking for action/adventure or love! I once spent a year traveling the world solo from Nepal to Romania to Fiji, where I learned 99.9% of humanity is pretty freaking awesome yet somehow doesn't share my love of ice cubes in a drink. I met my husband on the highway, literally. In fact our meet-cute was SO cute we had a whole story written about it in Ladies Home Journal. My twin boys placed second in the Most Identical contest at the I once spent a year traveling the world solo from Nepal to Romania to Fiji, where I learned 99.9% of humanity is pretty freaking awesome yet somehow doesn't share my love of ice cubes in a drink. I met my husband on the highway, literally. In fact our meet-cute was SO cute we had a whole story written about it in Ladies Home Journal. My twin boys placed second in the Most Identical contest at the International Festival of Twins. Their little sister placed first in the most adorable contest at the All The People In Our Living Room Festival. I once accompanied a pajama-clad Oprah Winfrey (and her puppies) through the laundry room of the Four Seasons. I have also been in a hotel room alone with a shirtless Mark Wahlberg. In both those instances, it was not what you think. Oh, and I went into early labor while on Stevie Nicks' tour bus. That is pretty much what you think. Jen Malone writes fun and flirty YA travel romances with HarperCollins and humorous "girl power" MG adventures with Simon & Schuster. She once spent a year traveling the world solo, met her husband on the highway (literally), and went into labor with her identical twins while on a rock star's tour bus. These days she saves the drama for her books. You can learn more about Jen and her books at www.jenmalonewrites.com. Find her on Twitter and Instagram @jenmalonewrites.